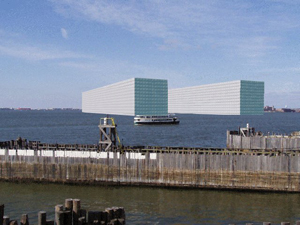 rebuilt as two big cubes, floating in the hudson river. 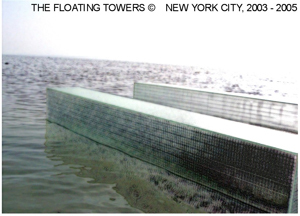 The location of the towers can be changed with the help of tow-boats. vanishing in one place, appearing in another. There are parks and gardens on their tops and large empty spaces inside for different usage [exhibitions, cultural events]. The memorial site will be left empty, except for a ticketoffice selling tickets for the floating towers. visitors will be brought to the towers by ferries. The towers are illuminated at night as part of the manhattan skyline. appear and can be seen in the same way as they are standing.